Welcome to our weekly field guide to 1950s horror and sci-fi movies and the creatures that inhabit them. This week: ugly Americans get their comeuppance in Cult of the Cobra. Interpretive dance as only those colorful Asians can do it! Snake-point-of-view shots add a degree of warped charm. Effects are well-intentioned, but weak. SYNOPSIS: 1945, India: a bunch of goofy American GIs are on leave, including baby-faced Nick and David Janssen lookalike Rico, and they're snapping pictures of everything they see, when a worried-looking snake charmer offers to sneak them into a secret ceremony in which women turn into snakes, and vice versa. The other guys—Tom, Carl, Pete and "Professor" Paul—don't exactly believe the story, but being Americans, they're willing to shell out big bucks in the hope of being entertained. That night, at the ceremony, they find entertainment galore, in the form of some of the most unorthodox interpretive dance you're ever likely to see, along with a bodysuited woman who writhes around in an undeniably serpentlike manner. There's also a great big basket with a serpent in it, which promises even more entertainment. Unfortunately, it's about this time that baby-faced Nick decides to show that he's got the brains of a cauliflower, which he does by taking a photo with a BIG HUGE FLASH that tells the assembled locals that there are heathen foreigners polluting their secret religious ceremony. Cue mayhem. This is far from the last stupid thing Nick will do, for in the ensuing fistfight, during which the Americans make their escape, Nick grabs the big basket with the deadly cobra-goddess in it—who presumably has sworn revenge on the desecrators of her holy ritual—and runs off. Maybe he intends on taking it to the US, so the goddess can have an easier time picking off these bozos, but he needn't have bothered; the snake is perfectly capable of getting around on her own. For that matter, she doesn't even have to wait till she's in the States… Oops! There goes #1. Back in New York, the filmmakers do their best to put the audience to sleep with eye-glazingly-dull relationship stuff. There's someone named Julia who we're supposed to be interested in, but she ain't half as interesting as the woman who turns into a snake and vice versa. (Though to be honest, who is?) For that matter, Tom's new neighbor Lisa is pretty intriguing too. Can't place that accent, though. And it's sure funny how dogs and cats can’t stand her. Soon we're all just hoping for the bodies to start piling up, which before long, they do. (Not to be cold-blooded or anything.) #2 goes in a moderately spectacular fashion, then there's a lull, then #3 goes fairly dramatically, then another lull, then #4 goes rather anticlimactically. You would think that #5 and #6 might catch on, eventually. Let's just hope that when they do, there's a frilly scarf lying around somewhere. Best line of dialogue in the movie: "I'm counting on you all to be so gay, I won't have time to be nervous." Moral of the story: Mind your manners, Yankee imperialist running dogs. What gets fatally snakebitten: A guy in a turban; a guy in pajamas; a guy with too much gel in his hair; a guy in a shirt and tie; another guy in another shirt and tie; a woman who's overstayed her visa. What gets saved: Countless episodes of future US military intervention overseas. Hmmmm. 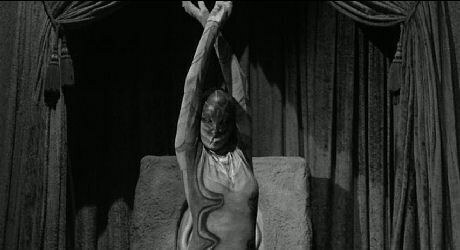 This reminds me of… …The Snake Woman (1961) and Korean chiller Sanyeo (1969), both of which repeat the trope of attractive-woman-becomes-deadly-serpent. For a man-becomes-snake alternative, check out 1973's Sssssss. Did you know? Snake worship is no Hollywood fantasy! Ancient Greeks and Egyptians both worshipped snakes; in Mexico, the Aztecs believed that a "feathered serpent" had descended from the heavens to teach humanity vital lessons. Ancient Rome assigned vestal virgins to tend their sacred snakes, while Buddhism teaches that divine revelation came via a cobra. Early Hinduism also incorporated elements of snake workship. Christianity is the outlier here, with the whole diabolical-serpent-villain-in-the-garden trope. Somehow their careers survived: Faith Domergue (Lisa) enjoyed a lively 1955, starring in this movie as well as This Island Earth and It Came From Beneath the Sea. Her career would stretch to 1974's The House of the Seven Corpses. Richard Long (Paul) would appear in the excellent House on Haunted Hill (1959) before appearing in much 1960s TV, including The Big Valley (1965-69). Marshall Thompson (Tom) scored roles in Fiend Without a Face and It! The Terror From Beyond Space (both 1958), plus First Man Into Space (1959). Kathleen Hughes (Julia) had appeared in It Came From Outer Space (1953), while William Reynolds (Pete) would go on to 1957's The Land Unknown. David Janssen (Rico)'s long career would include Marooned (1969) and Two Minute Warning (1976) as well as TV's Richard Diamond, Private Detective (1957-60), and The Fugitive (1963-67). BOTTOM LINE: No Academy Awards in sight, but it's got some suspense and a few chills.